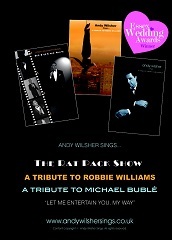 Andy’s brilliant THE RAT PACK, ROBBIE WILLIAMS & MICHAEL BUBLE Tribute Shows are thoroughly entertaining and professional. These shows are perfect for all your party needs including weddings, corporate events, birthday parties, anniversaries, and dinner dances. Andy has twenty five years stage experience as a lead singer and recording artist. This show is full of thrills and attitude. It includes Robbie’s greatest hits such as “Let Me Entertain You”, “Rock DJ”, “Angels”, “Feel”, “Millennium”, “She’s The One”, “You Know Me”, and many more. He even does a couple of Take That hits (“Could It Be Magic”, “The Flood” and a fantastic medley of “Pray, Everything Changes and Relight My Fire”!) This act has a fantastic light show and is truly just like the real thing, from authentic Robbie costumes and microphone stand, right down to the tattoos. We can also cover the whole evening’s entertainment with a fully functional and supervised disco, in between live sets providing a full evening's music. A typical party night would be; Background music to start, then 1 hour of The Rat Pack, then suitable disco music in between followed by 1 hour of Robbie Williams, then party music to finish the evening off. (There would be an extra charge for this.) All the equipment is PAT tested and the show is covered by full Public Liability Insurance.